Today, the Gmail team began rolling out a new Android version 5.6. The main impact of this update is the inclusion of Unsubscribe. 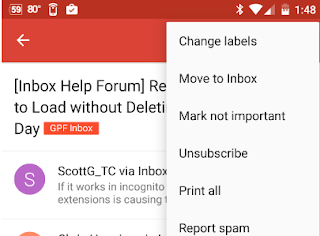 In a similar manner to the web version, users will be able to unsubscribe from mailing lists by clicking on the menu at the top of the conversation. I have seen questions about this for some time, so I am sure this is a welcome addition to the mobile Gmail experience.